Our worship is a deep exercise of our spirits before the Lord, which doth not consist in an exercising the natural part or natural mind, either to hear or speak words, or in praying according to what we, of ourselves, can apprehend or comprehend concerning our needs; but we wait, in silence of the fleshly part, to hear with the new ear, what God shall please to speak inwardly in our own hearts; or outwardly through others, who speak with the new tongue, which he unlooseth, and teacheth to speak; and we pray in the Spirit, and with the new understanding, as God pleaseth to quicken, draw forth, and open our hearts towards himself. Thus our minds being gathered into the measure, or gift of grace, which is by Jesus Christ; here we appear before our God, and here our God, and his Christ, is witnessed in the midst of us. Early Friends were clear that they came together to wait upon the Lord. They claimed Jesus' promise in Matthew 18:20, "For where two or three are gathered in my name, I am there among them." (New Revised Standard Version) They silently gathered to experience Christ's presence. It is often said that Catholics and Quakers have in common a focus on the actual presence of Christ in worship. For Catholics, Christ is present physically in the communion host. For Quakers, Christ is present spiritually as our priest. For Friends, Christ is always the true teacher. Christ may deliver a message in words through a human being. This might be through any person present in worship. However, Friends also recognized that God gifted certain people for the public ministry of the word. Starting very early in Friends history, those especially called to this public ministry met together in select meetings for mutual encouragement, discernment and prayer. These meetings sent out "The Valiant Sixty" - men and women who traveled the world proclaiming the gospel that Christ had come to teach his people himself. This ministry of the word was a free gospel ministry. It wasn't done to earn a salary, and ministers were expected to earn a living the same as anyone else except when they were called to travel in the ministry. The faith community would provide any material support needed to enable such ministry, whether it be taking care of their farm or business while they were away, providing child care, paying for passage on a ship, or whatever. But they were not salaried. As the Society of Friends became more structured, those faithful to a special call to ministry were formally "acknowledged" or "recorded" in the minutes of their meeting (congregation). The pattern of worship and ministry described above was maintained among virtually all Friends, even through the major separation which occurred among North American Friends in 1827-28, until the latter half of the 19th century. But that period saw a large part of North American Quakerism go in a new direction. It appears that the worship life in many Quaker meetings seldom seemed filled with a real sense of Christ's presence moving dynamically among the worshippers. Vocal ministry either dwindled to almost nothing, or no longer seemed freshly inspired. As many Friends were becoming increasingly concerned about decreased spiritual vitality in their meetings, the larger Christian community was experiencing revivalism. There was much energy in the revivals, and many Friends, particular younger ones, were attracted to them and often experienced a conversion in them. At the same time, some people newly converted in revivals looking for a church home came among Friends. In meetings where many individuals had been influenced by revivalism, the meetings themselves would sometimes sponsor "general meetings" of a revival character at other than their regular worship time. The revival influence began to come into the meetings for worship themselves. Music was introduced, "mourners' benches" were set aside for seekers to come for prayer, and Friends moved away from the exclusive emphasis on waiting worship. As these influences grew, some meetings asked revival preachers to come and preach regularly. At first, such pastors usually held other jobs for income. But before long, many meetings adopted the practice of hiring salaried pastors. Some of these had a background among Friends, but many came from other traditions and no seminaries taught Friends principles and practices. By the end of the 19th century, most Midwestern and Western meetings in the Orthodox branch of Quakerism had pastors. Patterns of Friends worship today are quite varied, but are generally divided into two categories. One category is usually referred to as unprogrammed. The other category is referred to as pastoral or programmed. Sometimes the distinction is expressed as being between meetings and churches. Unprogrammed Friends retain the practice of referring to local congregations as meetings rather than churches, but many (although certainly not all) programmed Friends have adopted the more common terminology in the large society and call themselves churches. In North America, about two-thirds of the congregations are programmed. In the rest of the "developed" world, Friends are largely unprogrammed. In the "developing" world, where the majority of Friends live today, the programmed pattern predominates. The unprogrammed Friends follow the pattern of gathering in silence without pre-planned sermons, music or other prepared elements. Anyone who feels moved to speak may offer vocal ministry. Generally, brevity in speaking is strongly encouraged, whereas early Friends sometimes spoke at great length. The practice of recording ministers has fallen into disuse in many places, and generally there is little emphasis on nurturing special gifts in the vocal ministry. Programmed Friends normally have an order of service, including a sermon and hymn singing. Sometimes they have a period of what they most commonly call "open worship", and sometimes "communion after the manner of Friends". Sometimes this is token or absent. There are now usually educational requirements for recording ministers, which was never the practice before the rise of the pastoral system. There is often a lot of suspicion between unprogrammed and programmed Friends. Unprogrammed Friends charge that the pastoral system is incompatible with the early Friends emphasis on the free gospel ministry and that programmed Friends have adopted too much from Protestant churches that early Friends would have called apostate. Programmed Friends charge that unprogrammed Friends have often abandoned the early Friends emphasis on Jesus Christ, and definitely their evangelical zeal. In the material above, I have sought to be as objective as possible. Now I will offer some perspectives of my own. These perspectives will be particularly applicable to North American Friends and, to some degree, British Friends - the two historic heartlands of Quakerism. The situation is probably quite different in the newer areas of Quakerism developed out of mission efforts of the last 120 years. I think there is a lot of truth in the charges both sides make against the other. 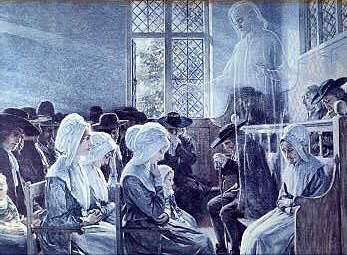 Unprogrammed Friends have held to the outward form of historic Quakerism, but that form was only a means of facilitating union with Christ. Many unprogrammed meetings are no longer even clear whether they are Christian, and it is difficult to find any common faith among them. Too many programmed Friends have fallen into the temptation to overly rely upon pastors as channels for Christ to speak to them. Many Friends have become laity. The idea of a laity is fundamentally contrary to Quakerism, and incompatible with scripture. Pastoral Friends often have come to place more emphasis in practice on the written and spoken word than on the actual experience of the Living Christ. This is not to say that all spiritual vitality has gone out of Friends. The above criticisms represent tendencies among Friends, and not all have fallen victim to the temptations of which I have written. And there are stirrings of renewal among both unprogrammed and programmed Friends. Furthermore, probably most Friends in the newer areas of Quakerism outside the historic Quaker strongholds have much more vivid experience of the reality of Christ than many in North America and Europe. Also, small worship groups seeking to break out of the negative patterns seen in many established congregations are forming in many places. Some of them try to emulate both the principles and practices of early Friends. Others seek to be true to the essential truths of early Friends, but feel practice needs to be more open to meet their time and environment. Good examples of the latter are the Creamore Fellowship in Great Britain, and Friends in Christ in Greenbelt, Maryland, USA (with which I am associated).